Yale is a lock manufacturer owned by Assa Abloy. It is associated with the pin tumbler lock, which is often known as the Yale lock. The business was founded as the Yale Lock Manufacturing Co. in Stamford, Connecticut, in 1868 by Linus Yale, Jr., the inventor of the pin tumbler lock, and Henry R. Towne. Yale & Towne Manufacturing Co, 1897. The name was later changed to Yale & Towne. Yale registered 8 patents with the U.S. Patent and Trademark Office between 1843 to 1857 about his pin tumbler safe lock, safe lock, bank lock, vault and safe door bolt and padlock. In the twentieth century, the company expanded worldwide through purchases, acquisitions and joint ventures with other companies in the industry, and employed more than 12,000 people. 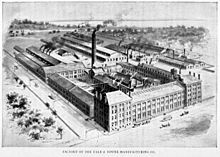 It established a British operation by acquiring the business of H&T Vaughan, a long established lock manufacturer in Wood Street, Willenhall, the historic centre of the British lock industry, and became the major employer in the town. The British Yale became involved with the early motor industry and supplied locks to various manufacturers until the early thirties when the cheaper diecast based leaf tumbler technology became available. Yale saw an unexpected revival of activity in the motor trade from the 1960s onwards when security fitters adopted its 'M69' window lock as a simple add on fitting to prevent theft, especially on vans. This continued to the early 1990s, when it was superseded by electronic devices. The British Yale had continued to supply all lock requirements to Rolls-Royce Motors until 1991, when there was an acrimonious parting. The British business had been sold by its parent to the Valor Company in 1987. After a further takeover by Williams Holdings, various sections of the Willenhall operation and outlying operation such as their diecasting foundry were closed. Ultimately, this led to all work being outsourced to the Far East, and the entire Wood Street site was closed soon thereafter and demolished, after having employed generations of skilled local people. The remainder of the British business was sold to Assa Abloy in March 2000. The Yale Security subsidiaries produce fire alarm systems, burglar alarms and glass break detectors. From July 2012, Assa Abloy started to relocate Yale from Lenoir City, Tennessee to Berlin, Connecticut, which was to completed by late spring of 2013, with the loss of about 200 jobs. The factory had been in Lenoir City since 1953, and at one time, had over 12000 workers. Wikimedia Commons has media related to Yale Lock Company. This page was last edited on 7 February 2019, at 03:42 (UTC).